Alpacas are camelids and until recently have belonged to the genus Lama. Over the years there has been a lot of cross breeding between alpacas and llamas, making it difficult to determine if this is the correct classification for alpacas. Modern technology and advances in DNA research has allowed scientists from the UK to use DNA testing to resolve the origin of the domestic alpaca. Their findings strongly support the vicuna as the ancestor of the alapca. This has prompted the classification of the alpaca to be changed to the genus Vicugna. Camelids are divided into two groups - Old World Camelids (which include the bactrian and dromedary camels) and New World Camelids (which include the llama, alpaca, guanaco and vicuna). Camels are found in Asia and Africa, while New World Camelids are native to South America. As a result the New World Camelids are more commonly referred to as South American Camelids (SACs), and collectively SACs are referred to as lamoids. It is estimated that the evolution of the alpaca began over 40 million years ago. While they started their evolutionary process in North America - it was the harsh mountainous climate of South America where the alpaca species finally evolved. Modern day lamoids evolved from North American lamoids belonging to the the genus Hemiauchenia. The evolution of the SACs began when the Hemiauchenia migrated into South America 3 million years ago. Migration occurred following the creation of a land bridge between North and South America. The Hemiauchenia underwent further evolutionary changes in order to adapt to the harsh mountainous climate of the Andes mountains. Three new genera evolved - the Lama (to which the llama and guanaco belong), and the Vicugna (to which the alpaca and the vicuna belong). Alpacas have been domesticated for around 6000-7000 years and have played an important role in the survival and economy of the Andean people. The value of alpaca was recognised as early as the 14th Century, when the Incas (South American Indians) ruled much of South America. They used the lamoids for food, fuel, clothing, transportation and religious ceremony. They were considered so important to the survival of the indigenous people that they were considered property of the government and were rigidly control. Alpacas thrived under this rule - totaling a staggering 50 million animals. It was at this time that the quality of alpaca fibre and alpaca numbers was at its peak. After the Spanish invasion of 1532 alpaca numbers dramatically declined. The Spanish introduced their own livestock (sheep, goats and cattle) - pushing the lamoids further up the altiplano region of the Andean mountains to elevations of over 4000m above sea level. The Spanish invasion not only decreased the number of alpacas, but disease wiped out a large number of the indigenous Indian population. This had a dramatic impact on the breeding of alpaca. 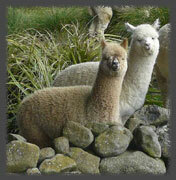 Organised breeding programme's were lost and llamas and alpaca were left to interbreed. It has been suggested that this mixed breeding practice transformed the alpaca of the Inca period from a single-coated animal, to the two-coated animal of today. This is supported by fossil evidence that show skin samples of 1000-year-old mummified remains of alpaca to have finer fibre with more uniformity than our modern day alpaca. Breeding programs of today are aimed at improving the quality of alpaca to back to where it was some 300 years ago. There were a number of attempts to export alpacas out of South America following the Spanish Invasion. These attempts were largely unsuccessful, with the majority of animals dying before they reached their country of destination. It wasn't until Sir Titus Salt (an English wool merchant) began importing alpaca fibre into England in 1836 that world interest started to grow. With large amounts of fibre and alpacas leaving South America, numbers began to decline. In 1843 (in an attempt to safeguard their industry) Peru, Bolivia, Ecuador and Argentina placed a ban on all live exportation of alpaca and unprocessed alpaca fibre. Chile, however, did not support this ban until 1930. This allowed Charles Ledger, in 1847, to import Chilean alpacas into Australia. Some of these animals were shipped to New Zealand and farmed in Canterbury for several years. However neither country was successful at getting the alpaca industry up and running at this time, with all of the imported animals eventually dying. By 1970, due to poaching and poor breeding programs, the South American alpaca was still declining. Realising the impact this was having on its economy, the Peruvian government stepped in, and gave land and breeding rights back to the pastoralists. With the success of the new breeding programs, alpaca herds started to flourish. By the 1980s South America was ready to legalise the exportation of alpaca. 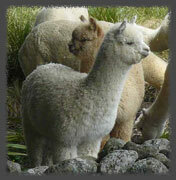 New Zealander Ian Nelson imported the first alpaca herd into New Zealand in 1987. Today, New Zealand has approximately 11,000 animals, America 60,000, and Australia over 100,000 - the largest alpaca population outside of South America. 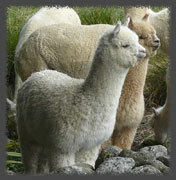 Peru now has an estimated 4 million alpaca - approximately 90% of the world's population. Peruvian alpaca are still considered the most dense and finest alpaca in the world.